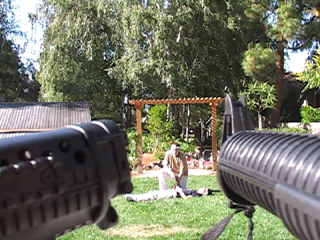 18 months later, an extended finale for the "Fight Movie" series was created. Taking place immediately after the events of "Fight Ultimatum", White Warrior (Kevin Johnson) gets captured, then breaks out with a vegeance. 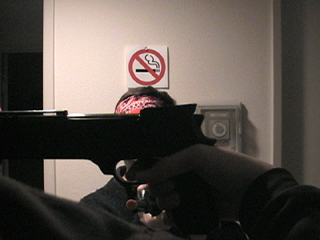 Some time in early 2005, Kevin decided he wanted to continue the "Fight Movie" franchise... even though I thought I had successfully killed it off in "Fight Ultimatum". Apparently not; the film starts directly where "Fight Ultimatum" left off. 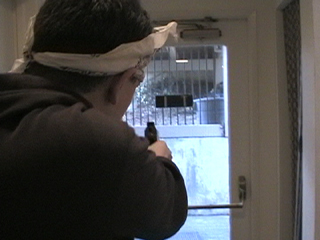 Shooting and post-production were very on-and-off, this being only the first of many Dead Moose, Inc. productions to have sparse shooting periods. Starting filming in February 2005, it almost completely stopped until photography was completed in June that year. At the end, we had three full hour-long MiniDV tapes of raw footage, even though the final product was only 6 minutes long! The sparse shooting also didn't help with the continuity, which was problematic. Around Fall 2005, I started to edit together the film, but Kevin was very disapproving, wondering where some specific scenes went. Eventually, I workprinted all of the raw footage to WMV file format for him to edit at home on Windows Movie Maker. Realizing continuity was hopeless, it was eschewed in favor of the best takes possible. Due to his request that there be blood in the film (even if it is pixellated video game blood), I found it very hard to work on and rotoscope; the rotoscope job took me until early May, on-and-off just like the rest of the production.